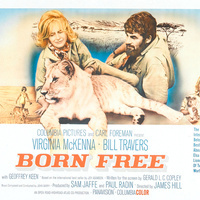 At a national park in Kenya, English game warden George Adamson (Bill Travers) and his wife, Joy (Virginia McKenna), care for three orphaned lion cubs. After the two larger lions are shipped off to a zoo in the Netherlands, the smallest of the three, Elsa, stays with the couple. When Elsa is blamed for causing an elephant stampede in the nearby village, head warden John Kendall (Geoffrey Keen) demands the young lion either be trained to survive in the wilds of the Serengeti or be sent to a zoo. The feature runs continuously throughout the day and, when available, shown with subtitles/closed captioning. Snacks permitted! Studio: Columbia Pictures Industries Inc.